Meadowood may have only 85 rooms and 250 acres, but despite its small size it has many of the amenities you'd expect of a larger resort, including a well-run complex of seven tennis courts. Set in its own wooded valley, just outside the town of St. Helena, this Relais & Chateaux gem started out as a private club for the Napa Valley community before blossoming as a resort in the 1970s. It provides a convenient base for touring the Napa Valley wineries, and a tranquil, creature-comfort-rich place to retreat to when you want to relax. 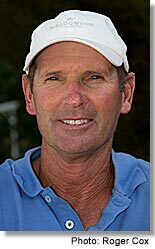 Although not a tennis resort with a high national profile, Meadowood has an excellent and long-serving pro in Doug King, who's run this seven-court complex since 1984. King played No. 1 for the University of California at Berkeley and in the late 1970s ranked No. 1 in the state. He trained under the legendary Tom Stowe, best known as Don Budge's coach and a man who helped develop the modern game. Tennis Programs. Much of the weekly calendar focuses on the needs of the local membership, and so as a guest you'll generally find more going on than you might expect of a small property. "The thing that is most distinctive is we have what you'd expect to find at a large facility in terms of programs and quality of service," says King. "Our goal is to integrate people into the membership program, to make them feel like this is their club." During a typical week there are men's and ladies' clinics, a couple of drop-in social round robins, and in summer weekly junior clinics. In summer, King also adds a once-a-month three-day midweek adult camp. "We cover everything from stroke production, drills, match play, singles and doubles, conditioning," he says of the program. 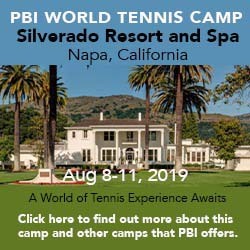 "It's primarily doubles play with a video program one evening for those who want a serious hard-core tennis experience." (check out www.tennisone.com for examples of his approach). Jasmine clings to the court fences perfuming the air and a huge maple tree arches over the clapboard pro shop at the heart of the court complex. Courts & Fees. 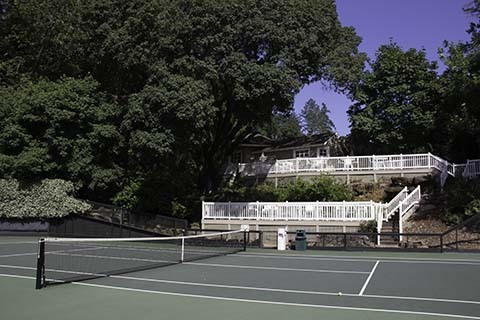 Meadowood's seven hard courts have been laid out on two terraces just above the Health Club and its outdoor swimming pools. The upper terrace holds three courts, oriented northeast-southwest, and a handsome clapboard pro shop shaded by a huge maple tree and surrounded by a wooden patio that looks southeast across the lower terrace of four courts oriented northwest-southeast. Trees and gardens border the complex, whose wooden fence posts harmonize with the rest of the resort. Court fees: $16/day singles, $24/day doubles. Golf Course. A 9-hole executive course of par 3s and par 4s runs west through the narrow valley then doubles back on itself and returned east. Spa & Fitness Center. Late in 2015, Meadowood opened a new spa set against the hillside and focused on tranquility. Rather than therapy rooms, it has eight spa suites, where you can relax and the therapist comes to you, planning individual treatments that use ingredients indigenous to the area, like black walnut and bay laurel. There's also an al fresco relation garden and the option to having spa meals delivered there or to your individual suite. The fitness center, meanwhile, occupies a two-story clapboard building between the tennis courts and lap pool, offering a variety of classes and workouts on a complementary basis to guests. Its second floor houses a room full of all types of cardio equipment—including exercycles, treadmills, Stairmasters, elliptical, and rowers—arrayed in three lines with windows on three sides, mirrored walls, and headsets to tap into any of three television programs or a choice of music. Around the edges are 9 or 10 Cybex machines and a few free weights and dumbbells. At the opposite end is a studio for classes such as yoga, Pilates, step aerobics, and meditation. While in between is a room a lounge chairs, a few more cardio machines, fresh fruit, and doors onto an outside deck with more lounge chairs and views of woods and the lower tennis courts. Personal training can be arranged as well. Each of the men's and women's locker rooms has sauna, steam, robes, slippers, and lockers. There's also an outdoor whirlpool. Croquet. This is not your backyard—or Alice In Wonderland—variety of croquet but the international competitive version, played in all white attire, that elevates bashing balls around a green to a sport requiring the strategy of chess. And ... Beyond that bicycles are available at the Health Spa, which provides maps of suggested trails, and there are 1.6 miles of marked hiking trails out along the golf course and up to the ridge overlooking the Napa Valley. Eighty-five private cottages, suites, and lodges nestle among the oaks and pines of the property's wooded setting in a private two-hundred-fifty-acre valley. Architecturally appealing in their white dormers, gabled roofs, French doors, and broad porches, they follow up inside with high, beamed ceilings, white wainscoting, watercolor landscapes, and stone fireplaces. Dining well has long been a Meadowood priority. Chef Christopher Kostow presides over The Restaurant at Meadowood, producing cuisine he calls "approachable, dynamic, evocative, and playful." Food and Wine named him one of the Best New Chefs in 2009, while Michelin awarded the restaurant three stars in 2011 and the San Francisco Chronicle awarded it a rare four stars. The menu changes regularly to reflect the best market and garden ingredients of the day, some of which are grown right on the property. Lodging consists of studios, several types of guest rooms, cottages, and suites, the last as large as 4 bedrooms. Rates vary seasonally and by type of accommodation. Travel Instructions. There is a county airport in Napa; however, most visitors arrive at either San Francisco International (SFO) or Oakland International (OAK). Travel time is roughly 1 hour from Oakland, 75 minutes from San Francisco.